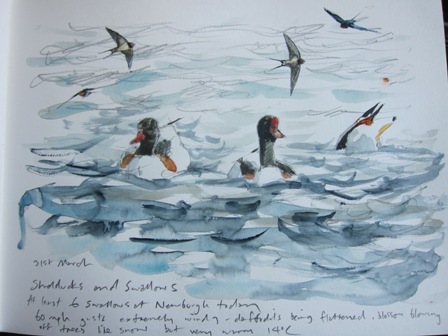 Newburgh Lake at lunchtime- Shelduck were bouncing on the waves and above them at least six Swallows. 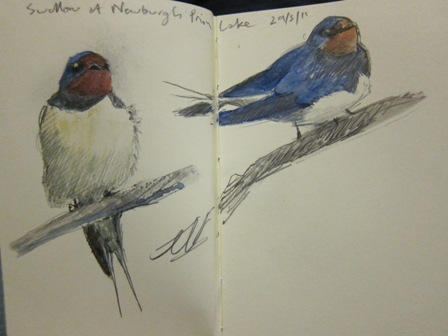 I have never seen this number of Swallows in March. They were making light of the 60mph gusts as they swooped low over the water to feed. At one time four passed low by some Shelduck. The gales have flattened many daffodils which were just coming up to their best show and Cherry Plum blossom is drifting off the trees like snow. A quick visit to Newburgh Priory Lake this afternoon in dull and cool conditions. The Green-winged Teal was in the usual area, in fact on each time I have seen it over the last 12 days it has never been away from an area of the lake about 100 feet from a point on the south shore. It rests and feeds in this area morning and afternoon. 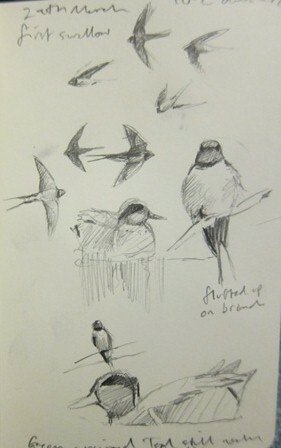 I was delighted to see a Swallow, my first this year. 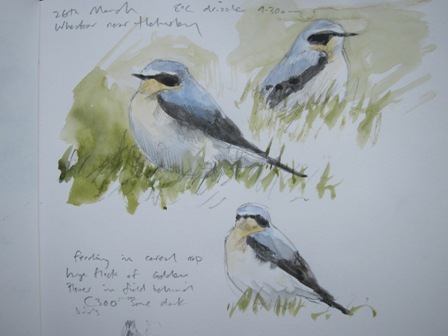 Last year my first sighting was of two here on 2nd April. It fed above the lake and rested for a while on some dead branches on top of a tree. A great walk in warm sunshine. I was able to walk across Hodge Beck which is totally dry at the moment. 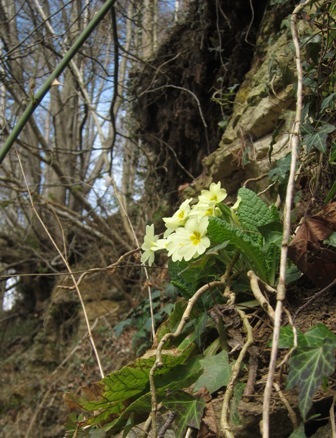 Some Wild Daffodils were flowering by the river bed along with Wood Anenomes and Primroses. 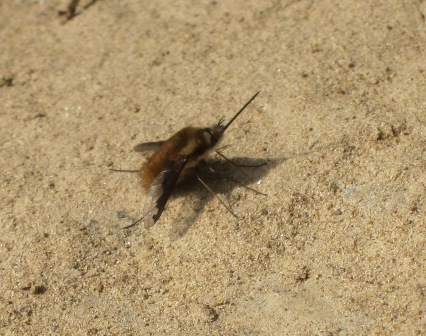 I also found one of my favourite insects, a Bee Fly, an insect to really enjoy at this time of year. They are a little like small bumble bees who hover around spring flowers using a long proboscis to take nectar. In gardens they love Aubretia flowers and I have often seen them on Cillas and Primroses. They also love to bask in the sun. This one was basking on the dry river bed. I must return to see this river after heavy rain. It has a large catchment area of hills including Rudland Rigg and Bransdale Moor. March here like most of the country has been exceptionally dry. 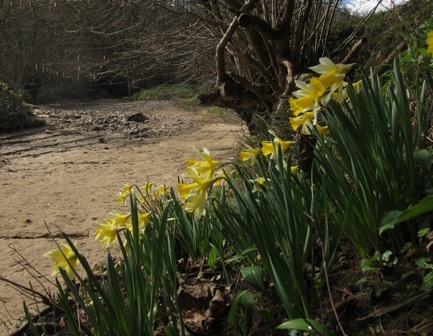 Wild Daffodils by the dry Hodge Beck. I stopped to watch a huge flock of Golden Plover just outside Helmsley. About 300 were resting in a freshly cultivated field. I also found a male Wheatear feeding in a cereal crop nearby, the first I have seen this year. A lunchtime visit to Newburgh found the Green- winged Teal in the same few square metres of water busily feeding by up- ending. The light today was superb with the sunlight slightly diffused by haze. This bird keeps a respectful distance from humans but gives superb views through a telescope. Very little else of note on the lake, perhaps thirty or so Eurasian Teal and eight Shelduck. Chiffchaffs were singing form the woods behind the lake. 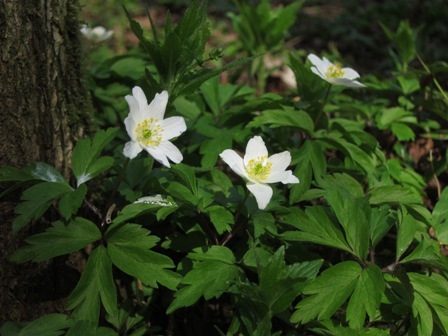 Spring has really arrived this week and daffodils are coming out along with the first few Wood Anenomes. In a few colder spots Snowdrops continue to flourish and Ransomes is growing at a tremendous rate. 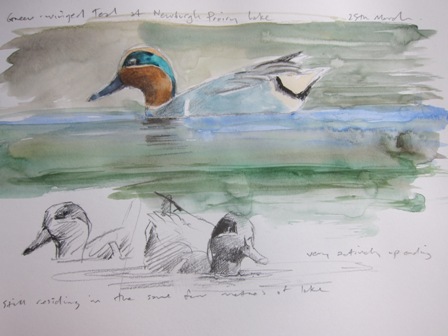 Green- winged Teal, watercolour in sketchbook. By the lake some toads were in amplexus. 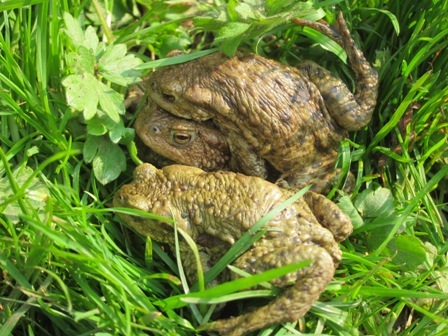 In Latin amplexus means embrace. Toads usuallyspawn several weeks later than frogs. As I moved some vegetation to take some photographs the spare male immediately grasped my finger tightly in the hope it might be a female- it took some careful effort to remove it! 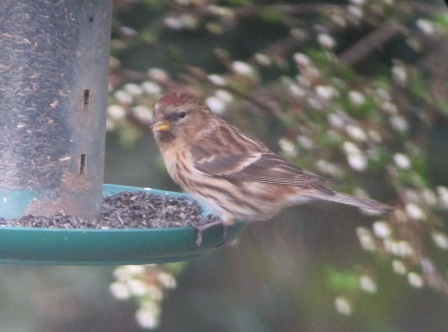 After several weeks of visits from Lesser Redpolls a very different Redpoll arrived yesterday. 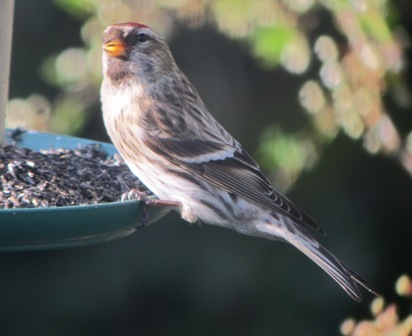 Much bigger than the Lessers and with much paler plumage the Mealy Redpoll is a Scandinavian visitor to our shores. 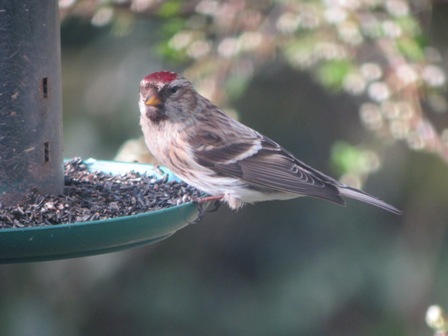 This visit comes after Lesser Redpoll numbers on the feeders have dropped presumably as birds head back to their breeding territories. The last few days have also seen a drop in numbers of Siskins visiting the feeders. 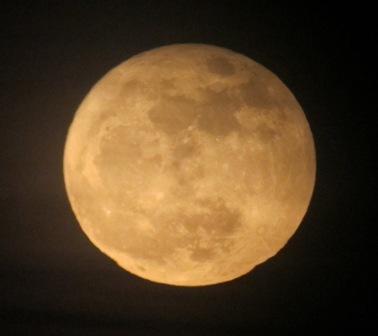 A beautiful perigee full moonrise. 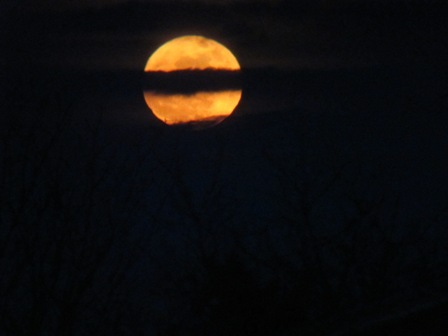 I was listening to Lapwings displaying by moonlight at about 11pm when I heard Whooper Swans in the distance. Over several minutes I heard them come closer then fade as the swans migrated roughly north west on their way to Iceland. 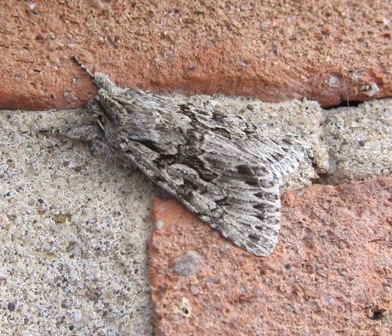 In the morning I found an Early Grey moth by the light. This species flies in March and its larvae feed on wild and cultivated honeysuckles.